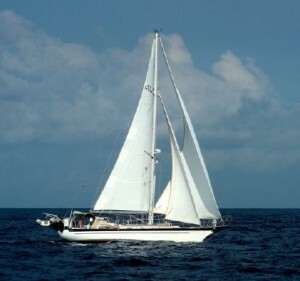 Strikingly beautiful inside and out, fully equipped and solidly built, this Chuck Paine designed sailing vessel is ready now for comfortable, safe passage-making and cruising wherever you want to go. With a modified full keel, cutter rig and fully battened mainsail, her seakeeping abilities are outstanding in a wide range of conditions. Sail Magazine has called the Cabo Rico 42 ‘The Ultimate Bluewater Cruiser’. Exterior design features a clipper bow, teak cap-rails, moulded-in stainless steel rub strake, dinghy and outboard davits. The well laid out interior is nicely appointed including solid teak joinery throughout. Fully air-conditioned at anchor with genset or dockside with shore power. Well ventilated with 19 hatches & stainless steel port lights and 4 stainless steel dorades. En suite shower compartment adjoining head. Avon RIB with 15HP outboard.